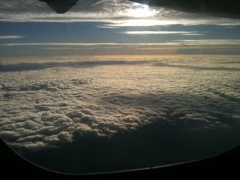 Flying over a sea of clouds I’m thankful that repetition has given me the upper hand. This luxurious 1.5 hour flight sure beats the hell out of the torcherous 10 Hr bus ride/3hr ferry ride situation I took last year this time. Spoiled by lifes blessings I grab my shades, some sunblock, and my flip-flops as I sail my way into an 80 degree winter day. Excited to take the ferry across this beauteous ocean I will keep my eyes peeled for the sea gypsies and be content with my own gypsy blood that I am following my own true path. Deep in the jungle on the mountain on the ocean I will carve out my home for the next few weeks with my man by myside. Excited for self-growth and exploration and the undoubted evolution that is to follow. Sawadee ba Mai!! Happy New Year from just above a sea of clouds. Love the gypsy princess faerie mermaid unicorn. This entry was posted in Uncategorized by Ali Luminescent. Bookmark the permalink.